Most people probably don't give much thought to the way Windows looks and behaves. We just accept it and get on with our work. 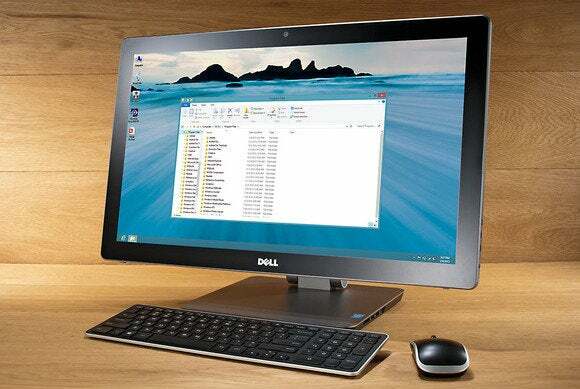 But there are lots of little settings hidden on your system to change the way your PC behaves. Don't like all those windows animations? You can change that. Want to have a small shadow underneath your mouse pointer or disable Peek? No problem. These tweaks were originally designed to help low-powered systems improve performance, but there's no reason you can't use these tweaks to suit your own personal tastes. 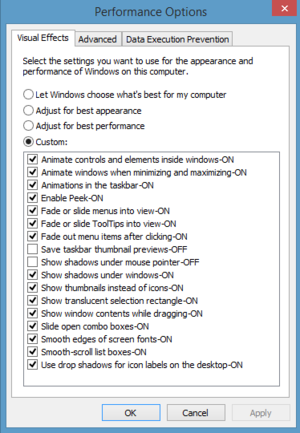 The Performance Options window in Windows 8.1. Open the Windows Control Panel, then click on System. (Select the Large Icons or Small Icons "View by" setting if you don't see System—a separate option from System and Security—in the Control Panel.) Now, select Advanced system settings in the left-hand navigation panel. This opens a smaller window called System Properties with the Advanced tab selected. Under Performance click the Settings... button. Finally, we've made it to where all the action is: the Performance Options window. Everything we want to look at is under the Visual Effects tab. By default, the radio button labeled Let Windows choose what's best for my computer is selected. Just click the Custom label to start choosing your preferences. A popular choice, for example, might be to turn off animations when you minimize or maximize a window. If you turn this off, your application windows will appear and disappear as you minimize and maximize, without the shrinking and expanding animations shown by default. You can also turn off the "show desktop" feature that is triggered when you hover or click the small empty space on the extreme right of the taskbar. To do this, deselect the check box that says Enable Peek-ON. There are tons of little changes you can make to tweak how your desktop behaves and most of the items in the list are self-explanatory. As with any Windows feature, you have to click the Apply or OK button before your changes will take effect. Keep in mind that if you click OK that saves your changes and dismisses the window, while clicking Apply keeps the window open allowing you to make more changes.